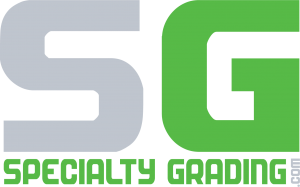 Specialty Grading specializes in an array of services. We are qualified and highly skilled excavating contractors and grading contractors prepared to complete your project efficiently, professionally, and to meet your utmost standards. Precision, accuracy and quality is what you can expect when you choose Specialty Grading. Of all the excavation companies in Arizona, we strive to be your top choice. Your preferred dirt work contractors doing the heavy work including, preparing and leveling your lot to build a new structure, footing excavation to create a solid base, drainage services, cut and fill excavation and yard excavation. We can clear trees and shrubs, maintain your driveway, or dig trenches for utilities for your Prescott Valley home. Lot preparation for home building and commercial sites to support a new structure requires the handy work of experienced, knowledgeable and detailed professionals. We test the qualities of the soil, remove unstable dirt, level the land…we do it all with a goal to meet your project deadlines and satisfaction. Providing stable, compacted dirt to withhold your new structure for years. Defend your building’s foundation, landscape and hardscape features from costly water damage by ensuring that the right drainage system and measurements are applied to the land before, during and upon completion of a residential or commercial site build. Specialty Grading uses skilled excavation techniques to safeguard your home or building from the devastation of improper water flow. Specialty Grading uses their excavation techniques to create the right depth and gravity slope for fully functioning septic systems and leach fields. We have the expertise knowledge on trenching and excavation for Primary and Secondary Power Lines, and Plumbing Lines. Your hook ups are in good hands as we test all our work providing you with our guarantee that is suit for satisfaction. We are happy to prepare your new road or driveway for long-lasting use with fastidious skilled grading excavation skills. We also repair driveways and roadways from the damage caused by the elements. Make it smooth or make it new, our excavation services have you covered. Using trusted land grading equipment that is in top condition, we provide meticulous land grading to ensure a sound foundation for a new structure, applying the uniform percent grade. We shape the land to prep for a new structure, finalize for the landscape and guarantee with a certification from the engineer.